Very much what iRacing's relative black box does. Very much what iRacing's relative black box does. Something I've been missing for a long time and I'm surprised no one has done this before. EDIT: You can remove the border, change background color and resize the plugin in the ini file. Charly69, Alex72, Kinduci and 6 others like this. works incredibly. fabulous work. thank you! Are there any plans on updating the awesome plugin to dx11? 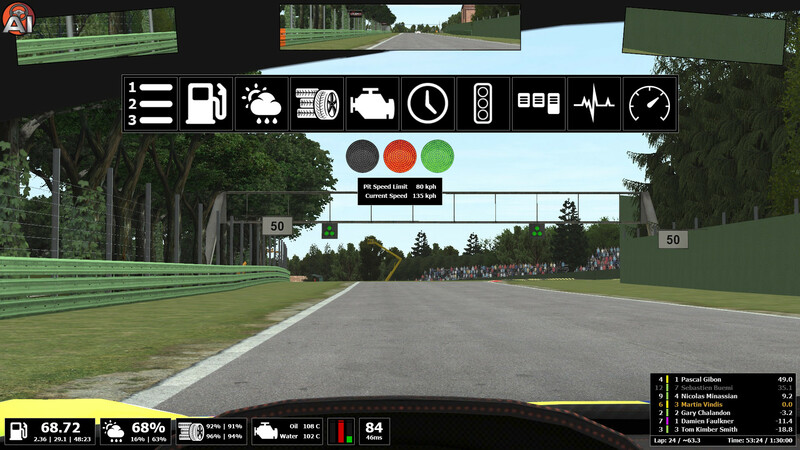 I am so used to having the relative box from all my time spent on iRacing, so it's great to now have it on rFactor 2. Thank you!!! This is a very useful plugin, and I find it essential to sim racing. It's even more useful for multi-class racing. However, I'd like to see this be able to function entirely on it's own. For right now, it's only a relative. I don't know if it's possible, but it was would be amazing if it could also include information about laps/time in the race, possibly car status, and other info. Is it even possible? I don't know. But if there's a way to add different menus, taking even more influence from iRacing, that would be outstanding. Thanks for the review Joe. I was working on something similar to what AC has, a plugin with various modules/widgets. The relative module was included in a very early build and people really liked it but RL stuff happened and I just didn't have the time to continue working on the project so it got cancelled but I decided to release a standalone version of the relative module as some (including me) see it as a essential plugin. Good news tho! I now have more free time again and I'm picking it up once again. No idea when it's to be finished so you'll have to wait a bit longer but here is a picture of what you can expect as a first release http://i.imgur.com/0HRe2xD.jpg and I will probably add more modules in the future. Great plugin for racing. Can customize it too with colors/transparency/size. Essential plugin. Amazing job Martin! A "must have" for Online racing! A great little mod, well worth a download if you race online with others! Great idea...never too late! Would you consider adding a transparency setting do this matches the look of most other HUD-related mods? Also, what does the edit mode do? I can't get it to activate, though may not actually need it. Thanks for the kind words. Transparency can be changed in the ini file and edit mode lets you move the window around, can also be manually edited in the ini file, not sure why it doesn't work for you tho.